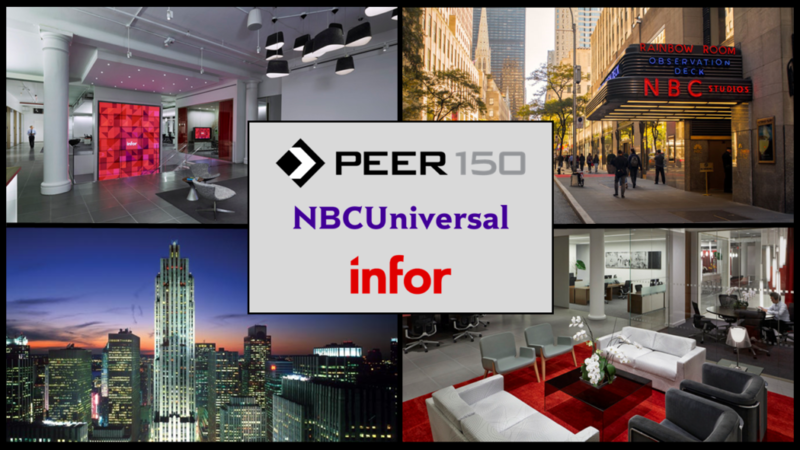 The New York members of The PEER 150 are honored to host a day of networking and content at NBCUniversal & Infor Headquarters. Attendance is open to senior human resources executives approved by our PEER 150 team. You are invited to join us for an day of engaging content and idea sharing, along with great food and plenty of networking time with your peers. We look forward to seeing you on Thursday, October 4th! 8:00 am – Registration & Breakfast @ NBCUniversal, Inc.
An NBC Page will serve as your host and behind-the-scenes expert, guiding you through the historic halls of 30 Rock. Enjoy behind-the-scenes access to the studios where your favorite shows are made. Like Saturday Night Live, The Tonight Show Starring Jimmy Fallon, Late Night with Seth Meyers and more. Please note NBC Studios is a live, working TV production facility and therefore we cannot guarantee that any particular studio will be available to see on the tour. However, tours usually cover at least two studios. With Infor, you can easily find the right solutions for every aspect of your business. We build complete industry suites in the cloud and deploy software that puts the user experience first, leverages data science, and integrates easily with your existing systems. Over 90,000 organizations worldwide rely on Infor to help overcome market disruptions and achieve business-wide digital transformation. The world of work is experiencing unparalleled transformation due to a wide variety of factors including technological, economic, political and demographic shifts across the globe. The pace of change is increasing, as Artificial Intelligence and digital ecosystems are redefining how work is accomplished. At the same time, the next generation of workers are establishing new norms around career progression, communication, flexible work environments and organizational designs that eschew the traditional hierarchical architecture in favor of a more agile arrangement. Bottom line: no leader is immune to these changes. Come learn how these trends are impacting all of us, and how you will need to proactively adapt and prepare for the new world of work. Influence Greatness is an unforgettable look at six key elements that unlock the secrets to developing great people, teams, and cultures. Leaders learn the importance of being an influencer and how six key elements, applied effectively, can create highly successful cultures. Then, with a keen understanding of three essential ways to convey appreciation, they are empowered to incorporate best practices that inspire employees to engage. And when people engage, companies grow. It’s an exciting time to be in HR with most companies and industries experiencing disruption to their business models and reexamining their workforce strategies. The bar has never been higher for CHROs to future-proof the workplace and leadership teams are investing in key human capital initiatives during their transformation journeys. Discover what are the ‘must haves’ on today’s HR agendas including personalization, predictive analytics, digitalization, and broadening talent pipelines. Learn how the tempo is picking up in these areas and what high performing HR teams are doing to meet the challenges now and in the future. 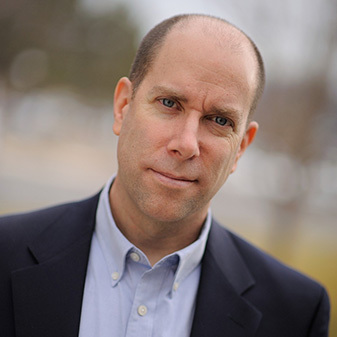 A frequent speaker at ATD, the world’s largest training and development conference, Jeff Birk has inspired thousands for the last 25 years as a trainer, speaker, stand-up comedian and corporate emcee for the likes of Honda, Bose, Virgin Trains, Footlocker, Pepsi and Pier 1 Imports. His rare combination of stand-up comedy along with years of corporate keynoting and training engages and inspires audiences around the world. With a unique balance of humor and poignancy in every message he delivers, Jeff draws on his trademark style and experience to make presentations on employee recognition, career achievement, and team building more purposeful, meaningful, and memorable. In his spare time he listens to as much music as he can ranging from Led Zeppelin and Pink Floyd to Hans Zimmer and Rachmaninoff. He lives in the Salt Lake City area with his wife and daughter. 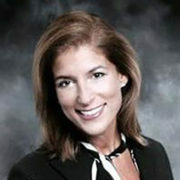 Carrie Maltese is the Senior Vice President of Corporate Human Resources for NBCUniversal. In this role, Maltese oversees all human resources responsibilities for the Human Resources organization, Legal division, Diversity & Inclusion, Corporate Communications, Strategic Initiatives & Global Talent Booking, Corporate Events, and Executive Communications. She also oversees the centralized employee service center, HR Connection, and corporate projects impacting HR process and employee policies. She reports to Vicki Williams, Chief Human Resources Officer. Maltese previously served as Vice President, Human Resources leading the generalist team for the corporate functions since 2014. Prior to this, she was the Vice President, Human Resources for NBCU’s Operations & Technology (O&T) organization. In that capacity she oversaw the human resources responsibilities for 4 divisions within O&T’s expansive global operations, including Field Operations & Production Services, Business Services, Finance and Global Security. Maltese was also responsible for all organization development initiatives for the 4,000+ employee organization along with managing the technical talent pipeline programs, talent acquisition partnership, and NBCUniversal’s Page program. Maltese has held various human resources leadership roles in Digital Media & iVillage, Campus Relations, and Staffing. 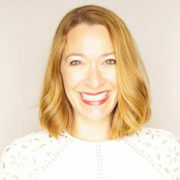 She originally joined NBCUniversal in 2001 as Manager, Guest Relations & Page Program. Maltese holds a Bachelor’s degree in Mass Communications from Quinnipiac College. She lives in Armonk, NY with her husband. Marcus’ goal is to change how people work by designing innovative ways to combine technology with human behavioral characteristics. This involves engaging with Infor clients to develop and execute their people-related strategies using digital platforms and leading design practices. The result is an organizational culture that uses an evidence-based approach to enable each individual to reach their full potential. Prior to joining Infor, Mossberger was a Product Manager at GE Healthcare, where he was responsible for the creation of market demand for HR, Payroll and Talent Management solutions. 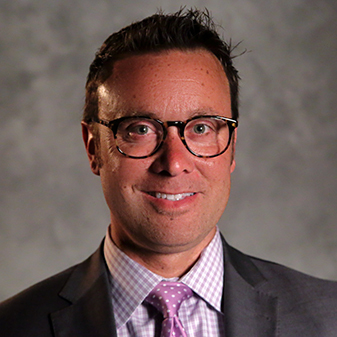 Preceding his leadership there, he held various positions focused on HR processes, workforce strategy and sales execution at Cerner Corporation. His genuine passion stems from years of working as an HR practitioner, as well as his experience enhancing operational capabilities in a variety of industries including healthcare, retail, professional services and non-profit. Mossberger holds a master’s degree in Human Resources from Ottawa University and a bachelor’s degree in Psychology from the University of Kansas. His 15+ years of experience have fueled thought-leadership contributions about the future of work in a variety of publications including Fast Company, and he regularly speaks at industry events and conferences. 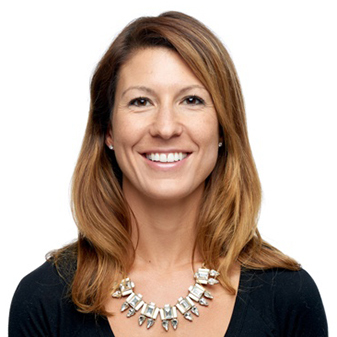 Stephanie Penner is a Senior Partner with Mercer and leads the Career business in the East (US) market helping organizations optimize their people resources and prepare for the workplace of the future. 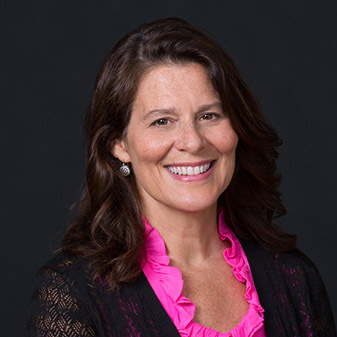 For over 20 years, Stephanie has been consulting with global and domestic organizations on a broad range of human capital issues that continue to grow in complexity and change at faster speeds. Never has there been a more exciting time to be part of the evolving nature of work as organizations strive for growth, agility and innovation. Stephanie’s consulting background includes advising global and high-growth organizations across a wide spectrum of talent-related areas including: re-imagining total rewards, market relevant compensation design, multi-dimensional job architecture, M&A integration, performance management makeovers, data-based decision-making through workforce analytics and overall innovative attraction and retention strategies. Her clients span various industries including technology, consumer products, manufacturing, healthcare, financial services, and retail. Rebecca Romano, Vice President and Head of Talent Development is responsible for NBCUniversal’s corporate university – the Talent Lab, in addition to the design and implementation of enterprise-wide talent development programs and practices across NBCUniversal’s portfolio of businesses–including performance management, employee survey, talent review, as well as the Page Program, NBCUniversal’s premier early career media development experience. 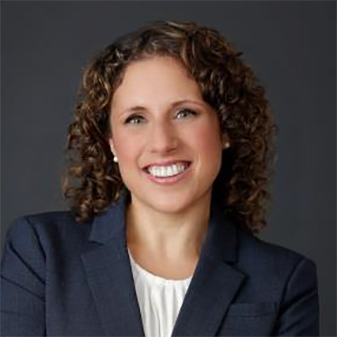 Prior to joining NBCUniversal, Rebecca held a number of leadership development and talent integration roles across Bank of America. Most recently, she was the Learning and Leadership Development Executive for Merrill Lynch U.S. Wealth Management/Bank of America where she was responsible for the talent strategy, leadership assessment centers and pipeline programs for Global Wealth and Investment Management. 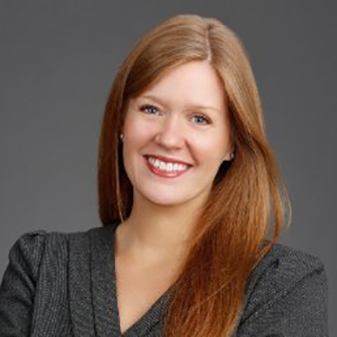 Before joining BoA, Rebecca was the Head of Organization Effectiveness for Guardian Life Insurance Co. of America. She was responsible for providing strategic and tactical leadership to drive a newly instituted talent management, culture and succession strategy for the company. Rebecca started her career with Personnel Decisions International (PDI) in executive selection, assessment and coaching. Rebecca holds a Ph.D. in Industrial/Organizational Psychology from Illinois Institute of Technology in Chicago, and a BA from Ohio University. Rebecca resides in Brooklyn with her husband Jeff and twin girls, Reagan and Jillian. 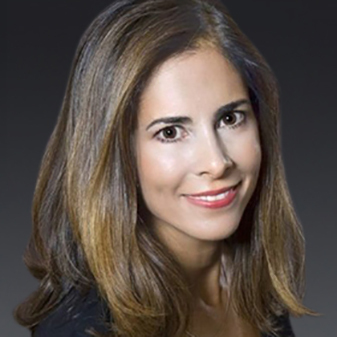 Cara Stein is Chief Talent Officer and Senior Vice President for NBCUniversal, a newly created position that she was appointed to in June 2011. She is responsible for talent management, including hiring staff, executive development. Since joining the company, she has been a trailblazer in how the company hires, trains and retains talent throughout NBCUniversal. Stein and team have developed a series of unique leadership experiences for executives at all levels of the company. Under Stein’s leadership, the NBCUniversal Talent Lab was created with the purpose of creating a more strategic, well-informed and engaged workforce. She has also modernized the traditional employee survey and performance feedback process at the company. Stein’s currently re-imagining the early career development programs, including the premier Page Program, NBCUniversal’s longest running franchise. Stein is currently working on a company-wide initiative to maintain and nurture an inclusive environment for women across the entire NBCUniversal Portfolio. She was instrumental in the launch last year of NBCUniversal’s new career site, which realized a dramatic increase in traffic and is credited with improving the candidate experience. Prior to her work at NBCUniversal, Stein served as partner and television packaging agent at William Morris Endeavor, a worldwide leader in the talent representation industry. Stein represented numerous well-known writers and producers for both late night and prime time television series. She also represented actors who built their own production companies, most notably Whoopi Goldberg. Stein also oversaw operations and human resources for the WME New York office during her 25 years at WME and its predecessor, the William Morris Agency, which represented some of the most well-known entertainers of the 20th century. Stein served on the Board of Directors at WMA and subsequently was a senior partner at WME. Widely known and highly regarded for identifying talent and developing careers, Stein has been named by The Hollywood Reporter in its Women in Entertainment Power 100. Born and raised in Huntington, N.Y., Stein is a graduate of Grinnell College, and she is married to Dr. Barry Rosenfeld, a forensic psychologist and professor at Fordham University. They reside in Manhattan with their three daughters. Vicki Williams was named Chief Human Resources Officer for NBCUniversal in July 2018. She is responsible for human resources globally for the company, including compensation, benefits, development and learning, talent acquisition, executive search, HR systems, and the HR service center. Williams joined NBCUniversal in May 2011 as Senior Vice President, Compensation, Benefits and HRIS. Her role expanded to include HR support for corporate functions and oversight of the HR service center. Prior to joining NBCUniversal, Williams was a consultant on compensation and benefits as a Partner with Pay Governance LLC and previously as a Principal with Towers Perrin (now Willis Towers Watson). In these roles, she worked directly with boards of directors and senior management on all elements of compensation and benefits. Williams worked across a number of industries, but maintained a strong concentration in the entertainment & media industry. Williams was named to the Board of Directors of Annaly Capital Management, effective January 1, 2018. As an independent director, she serves on the Audit Committee and Compensation Committee. Annaly is a leading diversified capital manager that invests in and finances residential and commercial assets. Williams received a B.S. in Education with a concentration in mathematics and an M.B.A. with a concentration in finance and quantitative statistics, each with honors from the University of Georgia. After serving six years on the Terry College of Business Alumni Board for the University of Georgia, she now serves on the Emeritus Board. Williams lives in Manhattan with her husband, Scott.